We’d love your help. Let us know what’s wrong with this preview of The Paper Chase by John Jay Osborn Jr.. Preview — The Paper Chase by John Jay Osborn Jr.
To ask other readers questions about The Paper Chase, please sign up. I have One L. by Scott Turow more than once because it is a really good book on the experience of Law School. Note: One L is non-fiction. Paper Chase is a novel. I have to admit, I was a little disappointed with Paper Chase. “The Paper Chase” is John Jay Osborn’s 1971 novel of law school and the main character Hart’s mostly one sided psychic war with contracts professor Kingsfield. Osborn started writing “The Paper Chase” in his first year at the Harvard Law School. The novel is formatted like a series of vignettes of law school linked together by Hart’s romance with Kingsfield’s daughter Susan, a relationship he finds every bit as challenging and frustrating as his relationship with her father. I’ve probably come to “The Paper Chase” is John Jay Osborn’s 1971 novel of law school and the main character Hart’s mostly one sided psychic war with contracts professor Kingsfield. I’ve probably come to Osborn’s novel backwards. I was first a fan of “The Paper Chase” TV series, later I saw the 1973 movie version of “The Paper Chase” and now, finally Osborn’s novel. The main characters focus around the study group formed by Ford, and includes Hart, Anderson, Bell, and Brooks (if you’ve seen either the movie or the TV series you understand the lack of the characters first names). In the novel the characters aren’t as well defined as in either the movie or the TV series, both of which Osborn had a large input in; for instance nowhere is Ford’s background mentioned, not even a physical description. There are a few tantalizing peeks at some of the personalities behind the characters, Bell is obsessed with his property outline, which he believes will supersede the casebook, and he turns out to be a selfish creep. “The Paper Chase” was created right at the end of the 60’s, 1970 but the counterculture mindset was still fully engaged, and the movie and the TV series always reflected those values (although Kingsfield and the college itself were conservative counter-balances). None of that exists in the novel, maybe Osborn employed a Hemingwayesque philosophy in the novel of it’s not only what you put in the book but that which is left out. The adversarial relationship between Hart and Kingsfield isn’t as well defined as in later iterations, although the characters comment upon it. 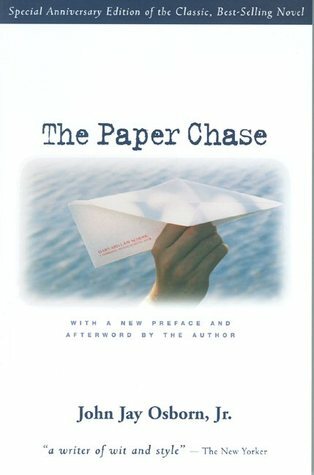 Perhaps “The Paper Chase” is meant to be seen so much through Hart’s point of view that it focuses only on aspects that present themselves in the immediacy of the moment. Excellent. I watched the movie going into Law School and enjoyed it. Reading this after 1L made me appreciate the story even more. I highly recommend this book to any future law student or anyone interested in getting a fairly accurate depiction of what life is like as a first-year law student. Several things have changed since this book came out, but overall, it does well in describing classmates, professors, and sentiments one encounters. This book is also an incredibly fast read. A great book with a timeless theme - the relationship between teacher and student - but with plenty of themes that make this a highly individualized novel. Also, I loved the insight into the mechanics of an ivy league law school. Working with law students here on the West Coast only added to the spice of this crazy rite-of-passage. This is a fabulous read. It's short, takes a day to read, and gets right to the point. It does the job so much more brilliantly and pungently than Turow's One L. This is the definitive book about the first year at the Harvard Law School. It really made me glad I went somewhere else. One of the worst books I've ever read, back in the 1980's. It had a particularly unsatisfactory way of ending; I remember swiftly reading the last few pages and in one fluid movement closing the book and placing it in the trash. Then I quickly stood up, left the room and closed the door! An easy read and I got a rough feel about how stressful it was to be a law student back then. But I have to say it lacked any detail on what law school classes were like. Just a basic overview of how hard they studied and how they were intimidated by their professors. Very few scenes showing tension between the main character and the contracts professor...like I remember from the TV show. This read was just as good as my first read back in 1972. In many ways, the novel influenced my classroom teaching. I couldn’t teach like Kingsfield but I did find ways to make teaching a dialogue. And I ways to convince students that they could SPOILER ALERT throw their grades in the ocean. A really good read about first year students at Harvard Law School. I may have been slightly prejudiced by watch all 4 seasons of the TV adaptation a number of years ago. I don’t get this book. Unless law school really does make everyone temporarily crazy, and focusing yourself, and ignoring the competition is the solution. But yuck. Having never been in law school--nor ever interested in attending--any finer points regarding accuracy and stereotypes have fully passed me by. But as a regular ol' English major, there were aspects of this which really appealed to me. The Paper Chase reads much less like a novel and more like a series of sketches. They don't necessarily link from chapter-to-chapter, and even once the whole thing is said and done a number of the chapters still feel a bit haphazard. Few books could get away with do Having never been in law school--nor ever interested in attending--any finer points regarding accuracy and stereotypes have fully passed me by. The Paper Chase reads much less like a novel and more like a series of sketches. They don't necessarily link from chapter-to-chapter, and even once the whole thing is said and done a number of the chapters still feel a bit haphazard. Few books could get away with doing that, but in this case it is pretty endearing. This sketch aspect (which becomes less obvious as the text catapults towards the conclusion) holds the reader out at arm-length, making them feel like they're voyeurs. If the entire story happens inside a building, then what is in the text of the book is what the reader can see by peeping in the windows. If I had to guess this was not intentional on the part of Osborn Jr. His writing is from the viewpoint of first-year law student Hart, who the reader is supposed to identify with and through whom connect with the text. This doesn't really happen--few people would understand the drive with which he flings himself into the two plot-points which divide the text: his drive to be recognized by his professor, and his attempts to gain some sense of normality with the girl he pines. I guess it's almost inevitable that such a short novel(la) would operate in the stereotype-osphere, but allowing that doesn't make The Paper Chase any more enjoyable. I think there was a great nugget of an idea here, but Osborn was either too busy or young to fully develop it. I do hope, however, that the stereotypes in his novel were a reflection of the various sides and states of mind he was in while at Harvard Law...that would be a little redeeming. I had wondered (before reading his bio) Meh. I guess it's almost inevitable that such a short novel(la) would operate in the stereotype-osphere, but allowing that doesn't make The Paper Chase any more enjoyable. I think there was a great nugget of an idea here, but Osborn was either too busy or young to fully develop it. I do hope, however, that the stereotypes in his novel were a reflection of the various sides and states of mind he was in while at Harvard Law...that would be a little redeeming. I had wondered (before reading his bio) if Osborn identified most with Kevin Brooks (the ill-prepared and mentally unstable student), and writing the novel was his path out of law. Turns out, no, he became a law school professor (I suppose destined to...the reason his middle name is always present is that he's a direct descendant of John Jay, according to wikipedia). But maybe he had a few moments of fear as a one-L.
Two good things:First, it is a good story. This is a story that needed telling. Second, the environment is described in a way that one can visualize it. Langdell Hall, the dorms, etc. The distracting feature of this book is the style in which it is written. I describe it as "stilted," but I don't mean stiffly dignified; it is rather "stacked together." Too clipped at some points and the pacing seems very fast. Overall, it is a fun read and, again, a good story. To quote ancient wisdom, "It is the Two good things:First, it is a good story. This is a story that needed telling. Second, the environment is described in a way that one can visualize it. Langdell Hall, the dorms, etc. Overall, it is a fun read and, again, a good story. To quote ancient wisdom, "It is the tale and not the teller." One word of advice. If you have never seen the movie, read the book first. The movie follows the book closely, but you will not be able to get the movie characters out of your head if you watch before reading. A quick read and one that was mostly enjoyable. There were a few things that felt pretty sexist but then the author portrayed Susan Kingsfield as a strong woman. The movie adaptation is one of my favorites, with an impeccable cast: Timothy Bottoms as Hart, Lyndsey Wagner as Susan and the esteemed John Houseman as Kingsfield. The film follows the story mostly, but at times it changes scene order or attributes actions to Hart that were done by others. The Susan character was definitely dialed back A quick read and one that was mostly enjoyable. There were a few things that felt pretty sexist but then the author portrayed Susan Kingsfield as a strong woman. The edition I read had "deleted scenes" in it: what a mistake! They showed that the writer is actually a pretty BAD writer -- I guess he had a great editor! This is a classic for law students, but I can't remember ever reading it. Parts were great, but parts seemed almost surreal? I debated between 3 and 4 stars. In the end, I decided, it is 4 stars for law students and prospective law students, 3 stars for everyone else. Reread in July 2016: not even as good as I remembered it. Why did I bother? Read this book to try to understand the law school phenomenon better. Nope, didn't help at all. Most of the book was the student freaking out about being ready to answer a question in his contracts class. Seriously, answer the damned question it doesn't effect your grade! That said it helps me kind of understand the psychology of a law student that thinks every word they say is all important. And it was short, and very readable, and a classic of law school. And I liked the ending. This book was disappointing. I have a fascination with Harvard Law School (not sure why) and was looking for some exposure to this world and I guess I got some. The relationship between Hart and Susan, in my opinion, was never fully developed and I really didn't find myself caring what happened between them. I found the ending to be bizarre and I didn't find it very satisfying. I cannot recommend this book or the movie either. I was always a big fan of the Television series from the 70's and the movie. I just realized (duh) that it was based on a book. All the characters are here - in fact the show and movie followed the book wonderfully. I love Hart and have always identified with him. Good read that filled me with lots of nostalgia for the dreams of youth. I read this before I went to law school. I can't remember why. I probably thought it would give me a leg up in law school - HAHAHAHA. About a group of Harvard law students in their first year of law school and how they deal with stress and expectations. Shows the ugly, competitive side of law school...so there's a lot of truth in it. I liked the book, it was very quickly paced and gave a good insight as to the insanity that goes on behind the scenes at a top notch law school. Similarly, I liked the underlying theme of what's important in life and the fact that the book addresses them and leaves you satisfied with the conclusion. I read this book around the time that the film and the television show had been very popular. It influenced me many years later when I was using real law libraries to do college research. I learned that much of the writer's perspective was distorted and vain. It was a good read at the time. I find it also very interesting that now that there is a new edition, no others are available. About John Jay Osborn Jr.
Books by John Jay Osborn Jr.